Blurb Description: Somewhere on Prithvi, a mortal survives a supernatural attack.In the dark realm of Atala, an evil goddess prepares to do the unspeakable.And a Yakshi finds herself at the heart of an other-worldly storm. Ardra has only known life as a Yakshi, designed to seduce and kill men after drawing out their deepest, darkest secrets for her evil mistress Hera, queen of the forsaken realm of Atala. Then, on one strange blood moon night, her chosen victim, Dwai, survives, and her world spins out of control. Now Ardra must escape the wrath of Hera, who is plotting to throw the universe into chaos.To stop her, Ardra needs to find answers to questions she hasn’t dared to ask before. What power does the blood moon hold? Is the sky city of Aakasha as much a myth as its inhabitants – the ethereal and seductive Gandharvas and Apsaras? Who is Dara, the mysterious monster-slayer, and what makes Dwai impervious to her powers? A heady concoction of fantasy and romance, Dark Things conjures up a unique world wrought of love and sacrifice, of shadows and secrets, of evil and those who battle it. If you don't know it yet, fantasy is my LIFE. I would give up my unborn child for the next great fantasy novel. Unfortunately, though, I can pretty much predict most of it, even the betrayals, and the twists and the plot points, and I HATE when I can do that. Really, WHAT WOULD THE POINT BE? 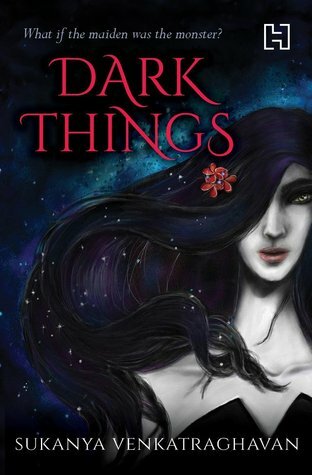 So, when Hachette asked me if I would like to review Dark Things for them, I found it super intriguing. I mean, JUST READ THAT SYNOPSIS. It sounded brilliant and out of the box, and exactly what I needed. I will admit, it did take me a while to get used to the book, and the writing and the world. I was pulled RIGHT IN, because of that explosive beginning. It was dark, seductive and all around the perfect starter. And then, however, came all of the world building and terminology that I was struggling to gasp, because all these new words and dimensions were being thrown around with pretty much no back story. All I could do was relate it to a more well heard of version (heaven, earth and hell) and angels and demons, but there wasn't a lot of explanation, and that left me sort of out of the loop. Now that I got that out of the way, and once I had sort of made sense of the world in my own crazy little head, the good part really came around. The good part about Dark Things is that you CANNOT guess what's coming to hit you next. The novel is filled to the brim with new characters, storylines you've NEVER seen before, places you wouldn't imagine (EVER. LIKE IT WILL BLOW YOUR IMAGINATION,) and I loved it. Because in a world of having the ability to predict everything, Dark Things had the originality to take me on a whole new kind of roller coaster. I'm not going to give you details about what the book contains, because this is one ride you need to take for yourself. A whole different kind of fantasy, that will leave you needing more! What was the last fantasy book you read? Do you think they're becoming too predictable? Which was the last fantasy that blew your mind? I love hearing from all of you lovelies, so please do comment and leave me your links as well so that I can stop by yours!